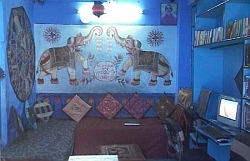 Cosy Guest House Welcomes you to the heart of the blue city of Jodhpur, it is away from noise & pollution at the foot of the fort it is brahmins family run guest house in the oldest, bluest part of the Jodhpur, dating back 549 years, the building has been the home of the same brahmins family since eight generations. From the romantic roof top restaurant there is the most spectacular view of the fort and blue city in Jodhpur. 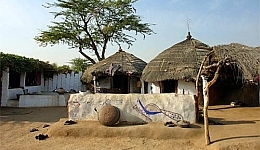 The Bishnoi's are a eco Friendly sect of Hindu religion, it is one of the different community of Rajasthan who are famous for there rich cultural Rajasthani Life and there true love for nature and animals. We intend to show that Indian and foreign guest a glaimpse of rich cultural life around their state of Marwar, A True Rajasthan. 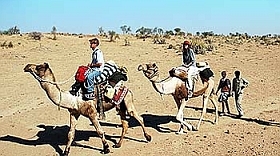 We organize full day and half day safaris at very reasonable cost and in some ways give our sincere efforts to help the poor and needy local people in this water scarce region. The name spells the comfort you would find at Cosy Guest House. The whole atmosphere sets you relaxing, smiling, happy & peaceful. It's like a home far away from home. There are a number of places to see around the Jodhpur, India. Most of these Jodhpur excursions are related to the past of Jodhpur. Here we are mentioning some of the famous excursions around Jodhpur.